← Regency Grande Nursing and Rehabilitation, Hosts Valentine’s Day Event! Posted on February 27, 2013	by Judah Gutwein, L.N.H.A. Regency Nursing and Rehab Centers across New Jersey have become synonymous with the very best in compassionate care and skilled nursing, while embracing every available technology to enhance their programs. I was therefore excited to come across a recent groundbreaking initiative from the Hospice of Michigan. 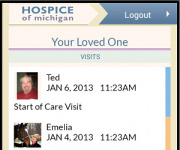 Beginning February 20, 2013, Hospice of Michigan is providing its patients and their family members with a free mobile app that will help them stay connected with the teams caring for their loved one. Studies have shown that 50 percent of family members do not live near enough to their ailing family members to participate actively in their care. HOM wants to close that distance so that caregivers, patients and their friends and family members can stay connected no matter where they are. The HOM Cares mobile app alerts family and friends when their loved one has received a visit: they can see a picture and read a short bio of the HOM team member making the visit; understand the role of that team member — whether medical, spiritual, social work, volunteer or another type of support and see the date and duration of the visit. The app was developed with a grant from Verizon Wireless for $24,500 and a matching in-kind donation provide by Compuware, the organization that developed the app for HOM. Additionally, the organization said it is exploring ways to expand interaction after a patient death that might include sharing of family photo albums, comments or memories, providing details on funeral arrangements and connecting those mourning a loss with grief support and related services. This entry was posted in HealthCare News, Long Term Nursing and tagged costs for hospice care, hospice care in new jersey, hospice care information, hospice in nj, hospice programs in jersey, is hospice compassionate?, palliative care, price of hospice care, what is hospice? hospice care. Bookmark the permalink.